Kim Hyesoon and Don Mee Choi join us to talk about reenacting trauma and narrating death in Kim Hyesoon’s powerful new book, Autobiography of Death, translated by Don Mee Choi. Special guests Forrest Gander and Brenda Hillman will also treat us to a reading of their poems and translations. Sponsored by The Center for the Art of Translation. 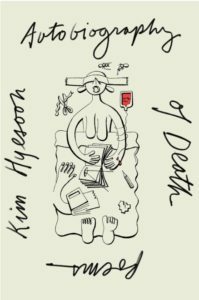 The title section of Kim Hyesoon’s powerful new book, Autobiography of Death (New Directions), consists of forty-nine poems, each poem representing a single day during which the spirit roams after death before it enters the cycle of reincarnation. The poems not only give voice to those who met unjust deaths during Korea’s violent contemporary history, but also unveil what Kim calls “the structure of death, that we remain living in.” Autobiography of Death, Kim’s most compelling work to date, at once reenacts trauma and narrates death—how we die and how we survive within this cyclical structure. In this sea of mirrors, the plural “you” speaks as a body of multitudes that has been beaten, bombed, and buried many times over by history. The volume concludes on the other side of the mirror with “Face of Rhythm,” a poem about individual pain, illness, and meditation. Don Mee Choi is the author of Hardly War(Wave Books, 2016) and The Morning News Is Exciting (Action Books, 2010) and has translated the work of several contemporary Korean women poets, such as Ch’oe Sŭng-ja, Kim Hyesoon, and Yi Yŏn-ju. Her translations include Anxiety of Words (Zephyr Press, 2008), Mommy Must Be a Fountain of Feathers(Action Books, 2008), All the Garbage of the World, Unite! (Action Books, 2011), Sorrowtoothpaste Mirrorcream (Action Books, 2014), and I’m OK, I’m Pig (Bloodaxe Books, 2014). Forrest Gander is the author of numerous books of poetry, translation, fiction, and essays. He is the A.K. Seaver Professor of Literary Arts and Comparative Literature at Brown University. His 2011 collection Core Samples from the World was a NBCC and Pulitzer Prize finalist for poetry. Brenda Hillman is the author of eight collections of poetry, all published by Wesleyan University Press, the most recent of which is Practical Water (2009). With Patricia Dienstfrey, she edited The Grand Permission: New Writings on Poetics and Motherhood(Wesleyan, 2003). Hillman teaches at St. Mary’s College, where she is the Olivia Filippi Professor of Poetry.